While this is a step in the right direction, he has many more surgeries up ahead. Archie’s has a very unique specialist eye medical team managing the growth and development of his eyes. He has an optomologist, ocularist and ocular plastic surgeon. It has already been an incredible journey over the last 16 months where there has been a dramatic change in the growth of Archie’s orbits. We have around a 3-4 year window for treatment before the bones fuse to get the orbits as large as possible to fit prosthetics. This is vital as it shapes the face as it grows. At 2 weeks of age we had our first appointment with the ocularist (person who makes the prosthetics eyes). He explained to us that Archie’s left eye has microthamia meaning he has a tiny reminisce of eye. This meant that the orbit had formed. As a result the space in the orbit is bigger than the right eye. Archie’s right orbit is considerably smaller than his left eye and does not have an optical nerve. He has anothamphia in this eye. We were told that the size of Archie’s eyes would probably not be symmetrical. We were told the road to getting Archie’s first pair of prosthetic eyes would long, involve several surgeries and procedures with no guarantees on how the orbits would grow and develop. We left that appointment with the our first set of conformers (a piece of plastic with a stalk on the end) which encourages the orbit to grow. Every fortnight for the first six months we would make the trip to Parramatta to get Archie’s conformers changed as his orbits expanded. It was apparent by around the 4 months that Archie’s eye left eye was responding really well to treatment and the right eye’s growth was much slowly. We had got used to Archie’s left eye falling out regularly it almost become a party piece asking others to help find his conformer. At 7 months the left eye had grown so well it was decided that we would put in his first painted conformer which looked like an eye. We were asked during this appointment what colour eye we would like. Unsure and in shock we allowed the ocularist to choose Slate Grey. Thankfully this was a great decision and Archie got his first painted conformer fitted on the 31st October on Halloween! It was at this point the decision was made to insert a hydrogel into Archie’s right eye as it was not growing any further using just the conformers. 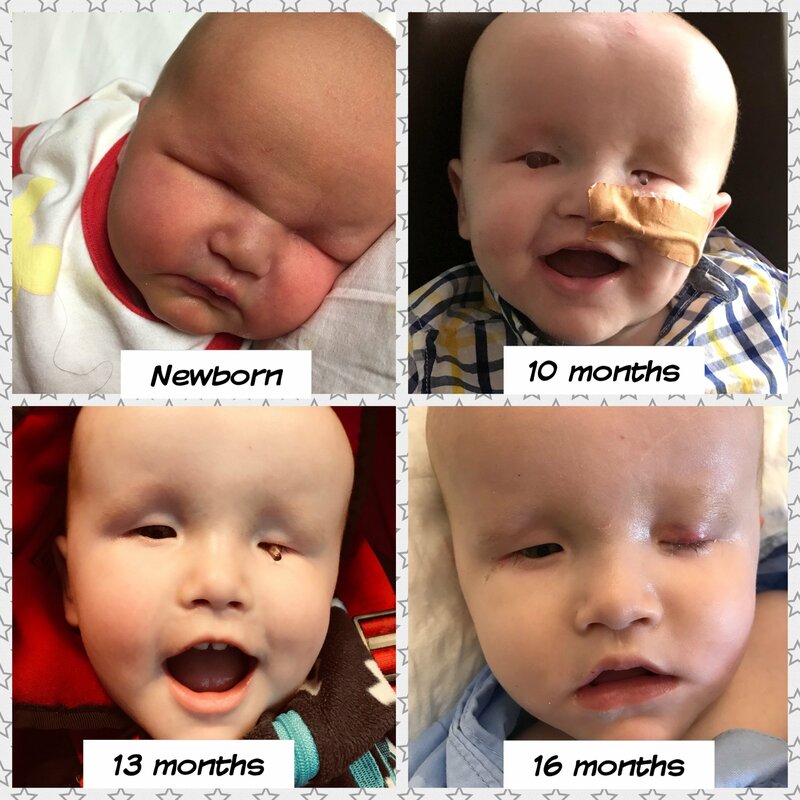 On May 16th Archie was operated on by Dr Tumuluri (Ocular plastic surgeon) at Westmead Childrens hospital in Sydney. A hydrogel twice the size was inserted into Archie’s right eye. Over a 48 hour period this hydrogel would expand to three times the size. The decision was made to put a larger hydrogel in the hope to avoid any further surgeries for the next year. During the surgery the ocularist also took an impression of Archie’s right eye to enable him to make his first prosthetic. This will be made and fitted in the next month. Archie’s recovery has been slow he has had pain, nausea and vomiting which is common side effect of the procedure. We now have a prosthetic nurse who will help us manage and care for Archie’s prosthetic. Every month his prosthetic will need to be removed cleaned and reinserted. There will be many more surgeries in the future to get both eyes as symmetrical as possible. He will require some plastic surgery to lift his eye lashes out. So far the results have been amazing and have made a huge difference in his appearance. To date, they have raised $101,637 via GoFundMe (https://www.gofundme.com/4p3tc9s), however, they are still working hard to raise money, as they need to continue accessing medical help and support.